Generally speaking, 3-D is anything appearing to have depth or thickness in addition to height and width. As a noun, 3-D refers to a system or effect that adds a three-dimensional appearance to visual images, as in films, slides, or drawings; as an adjective, it is producing or designed to produce an effect of three dimensions, such as "a 3-D movie." Online slang includes having a convincing or lifelike quality, as in "She and I totally connected dude, it was 3-D."
In terms of 3-D software, it is a category of software that represents 3-dimensional objects on a computer. This includes CAD/CAM, computer games, and animation packages. In terms of 3-D graphics, that refers to the field of computer graphics concerned with generating and displaying three-dimensional objects in a two-dimensional space (e.g., the display screen). Whereas pixels in a 2-dimensional graphic have the properties of position, color, and brightness, a 3-D pixels adds a depth property that indicates where the point lies on an imaginary Z-axis. When many 3-D pixels are combined, each with its own depth value, the result is a three-dimensional surface, called a texture. In addition to textures, 3-D graphics also supports multiple objects interacting with one another. For example, a solid object may partially hide an object behind it. Finally, sophisticated 3-D graphics use techniques such as ray tracing to apply realistic shadows to an image. Converting information about 3-D objects into a bit map that can be displayed is known as rendering, and requires considerable memory and processing power. 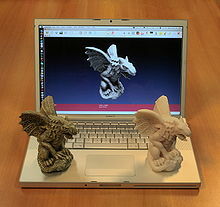 In the past, 3-D graphics was available only on powerful workstations, but now 3-D graphics accelerator are commonly found in personal computer. The graphics accelerator contains memory and a specialized microprocessor to handle many of the 3-D rendering operations. In terms of 3-D audio, it is a technique for giving more depth to traditional stereo sound. Typically, 3-D sound, or 3-D audio, is produced by placing a device in a room with stereo speakers. The device dynamically analyzes the sound coming from the speakers and sends feedback to the sound system so that it can readjust the sound to give the impression that the speakers are further apart. 3-D audio devices are particularly popular for improving computer audio where the speakers tend to be small and close together. There are a number of 3-D audio devices that attach to a computer's sound card. In terms of 3-D film, (also known as S3D ("Stereoscopic 3D") film, it is a motion picture that enhances the illusion of depth perception. Derived from stereoscopic photography, a special motion picture camera is used to record the images as seen from two perspectives (or computer-generated imagery generates the two perspectives), and special projection hardware and/or eyewear are used to provide the illusion of depth when viewing the film. 3-D films are not limited to feature film theatrical releases; television broadcasts and direct-to-video films have also incorporated similar methods, primarily for marketing purposes. There is now a hardware device called a 3-D printer. 3-D printing is a form of additive manufacturing technology where a three dimensional object is created by successive layers of material. 3-D printers offer product developers the ability to print parts and assemblies made of several materials with different mechanical and physical properties in a single build process. 3-D printers have become financially accessible to small- and medium-sized business, thereby taking prototyping out of the heavy industry and into the office environment. 3-D printers offer tremendous potential for production applications as well. The technology finds use in the jewelery, footwear, industrial design, architecture, engineering and construction, automotive, aerospace, dental and medical industries.